Kasia & I spent the past month visiting her family in Jastrzebie Zdrój in southern Poland. While there, we managed to squeeze in a tiny bit of cycling before the weather got nasty. En route to Poland, we had a small layover in Frankfurt, Germany. 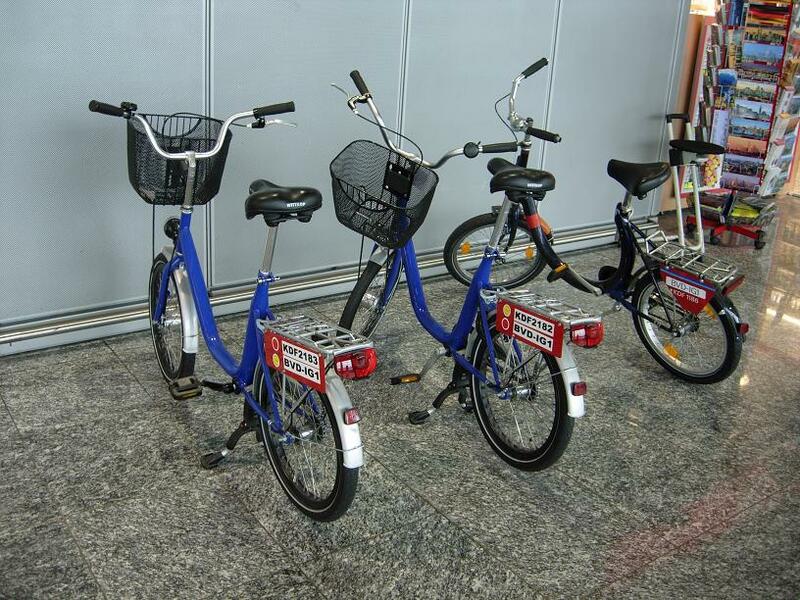 At the Frankfurt airport, I noticed these bikes, apparently available to either borrow or rent (I don't know which). This is a great idea for large airports. If you've got a connection to make and not too much carry-on (I'm sure a laptop case and more would fit into the basket) then grab a bike and go. Of course, this only works in countries that value personal responsibility. You wouldn't want to risk a rash of lawsuits from people falling off bikes that were allegedly under their own control. In other words, you'll never see this in the USA. Update: On our return trip, we had another layover in Frankfurt. This time, I saw only airport employees using these bikes. On the previous trip, I only saw one bike used, and it was definitely by a passenger. He wore a suit, carried a briefcase in the basket, rode the bike to the gate and boarded the plane (leaving the bike near the gate). About 5 years ago, while living in Poland, Kasia & I bought two new bikes -- Trek Navigators. At that time, they were the nicest, most "serious" bikes either of us had ever owned. Both of us biked as children, but neither had biked in many years. The Navigators were our "return to cycling as adults" bikes. The Navigators are part of Trek's "Bike Path" series, and are way comfy -- upright riding position, cushy seat, suspension seatpost, large low-pressure tires, and (on my Naviagor 300) suspension fork. The bikes are heavy, but not overly so. The longest rides we've done on these bikes was about 50 kilometers, and I think they'd be fine for longer distances as well -- as long as you're not in a hurry. Kasia & I moved back to the USA about 3 years ago, and the Navigators have been dutifully waiting in her grandparent's basement. After a little air in the tires, a little grease on the chain, and a little dusting, they were ready to go. At home in Woodinville, we always "kit up" before riding -- padded cycling shorts, cycling shoes, cycling-specific this, cycling-specific that, etc. Here in Poland, we had none of those accessories. When it's time to ride, just jump on the bike and go. It's very liberating. I had forgotten how much fun these bikes are. I plan to install front and/or rear baskets and use them for car-free shopping. If nothing else, we can always use them for quick beer runs to the Czech Republic. Still reeling from jet lag, Kasia, her father Marek, and I cycled from her parent's house to the Czech Republic, crossing the border near the Polish town of Golkowice. We mostly followed the R4, one of the designated EuroVelo routes through Europe. The R4 starts in Roscoff, France and terminates in Kiev, Ukraine. Along the way, it passes through Frankfurt, Prague, Krakow, and (coincidentally) Jastrzebie Zdrój. The R4 mostly follows quiet paved roads (and a few dirt/gravel roads) through small towns and villages, and skirting the edges of larger cities. Marek knows the area very well (he's lived here for more than 32 years, and cycles frequently) so there were a few scenic detours. Many trails in Poland are made from large concrete slabs. They're better than riding on mud or sand, but they can be rather jarring. I really appreciate my comfy bike on these trails. There are a number of designated scenic bicycle routes in this area. They appear to be relatively well marked. ...but now, where are we? Thanks to the Shengen Treaty, borders between EU member countries are basically meaningless. Now, crossing country borders within the EU is no more dramatic than crossing state borders within the USA. At the Polish/Czech Republic border, the structure still stands, but the guards and vehicle gates are gone. The administrative buildings used by customs and border guards are now slowly becoming shops and other businesses. Woo-hoo -- cycling in the Czech Republic! While in the Czech Republic, we stopped at a small shop and bought some alcohol -- still much cheaper there than in Poland. After stocking Marek's backpack, we headed home. The final kilometer or two was a very pleasant ride through Zdrojowy Park. In the end, we did about 20 miles that day, probably the second-longest ride we've ever done on the Trek Navigators. After all of the biking we've done in the USA over the past two years, we're in much better physical shape than when we lived in Poland. It shows. About one week later, we took another ride, again along the R4. There was no real purpose or goal for this ride, so we just enjoyed ourselves on some very scenic trails. Once you get away from the larger towns, a rather unique method is used to mark the R4 route. Instead of using metal signs (which could be stolen and sold for scrap metal) the signs are painted on tree trunks. Of course, not all views are scenic. This area has more than its share of coal mines. We spent two days visiting Kasia's aunt & uncle in Czestochowa. While there, her uncle made pieczonki, a wonderfully delicious/fatty/delicious/unhealthy/did-I-mention-delicious dish. It's basically cabbage, potatoes, sausage, bacon, and spices, arranged in layers in a cast iron pot and cooked over an open fire. No biking here (although we could have used it to burn off some of the calories) but I managed to get an action shot of her uncle with a gratuitous bicycle in the background. Making pieczonki, and ooh -- a bike! Near the end of our stay, we decided to spend a few days in Prague. The Zebrzydowice train station is only a 10 minute drive from Kasia's parent's house, and Prague is only a 4.5 hour train ride away. How could we not? Before the Schengen Treaty, the Zebrzydowice train station was a rather important customs clearing area. Now, it's rather quiet. One can still get trains from here to Prague, Vienna, Budapest, and Moscow. Once in Prague... well... what can I say? Prague is one of my favorite cities in the world, and certainly one of the most beautiful. I think his name is Arthur; you can just call him "Art"
Even a city like Prague cannot escape the Starbucks plague. There was a lot of cycle activity in the streets, the squares, and the pedestrian areas. We spotted two rather unique vehicles. The first was a Conference Bike -- a "bike" for seven people, used in the case for city tours. The second was a cool enclosed three-wheeler. I'm not sure if this was for transportation or tours (or just Vodafone advertising). Before traveling to Prague, I researched bicycle rental options in the city. During my online search, I stumbled across Grant's Prague Bike Blog, and his review of City Bike. On our first full day in Prague, we walked over to City Bike, spoke at length with Nick, and signed up for a 2-hour tour of Old Town the next morning. Mike showed us many interesting sights in Old Town, including areas we would probably not have found by ourselves. Another great visit to Prague. We can't wait to return! Maybe next time we can bring our own bikes and cycle outside the city. We'd love to cruise through the fields, valleys, and picturesque villages of this beautiful country. found your blog via fatcyclist. seems were both going to be part of the fatty army. when i fist saw your post i thought 'wow thats a really long post about riding in portland' ...oh...poLAND. then i felt dumb.